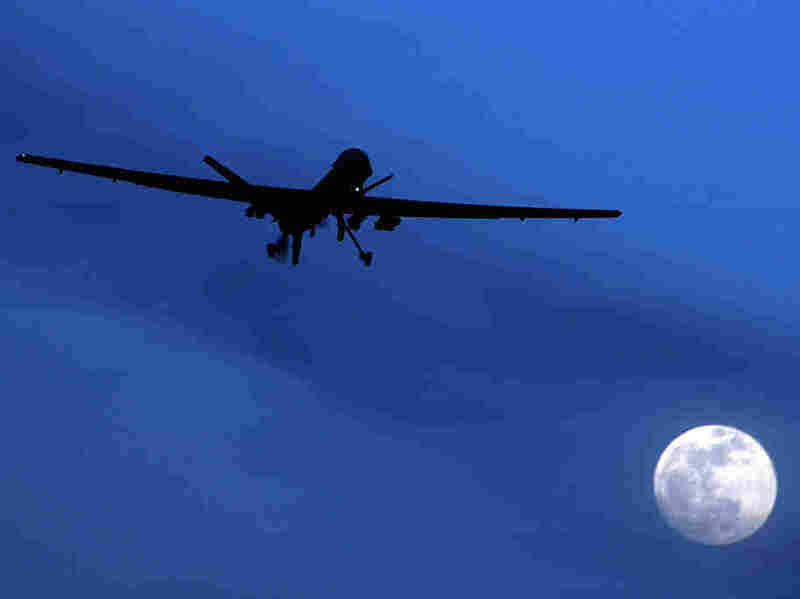 Why Have The Drone Strikes In Pakistan Skyrocketed? : The Two-Way New reporting on why drone attacks inside Pakistan increased dramatically in September. The US increasing pressure on terrorist safe havens, and a feared terror plot against Europe. As I mentioned yesterday the US has stepped up its drone strikes inside of Pakistan recently. There have been 20, that we know of, in the month of September alone. Well this morning two of the big dailies get an anonymous official to give some reasons why. The New York Times quotes a "senior administration official:"
The piece reads like a classic sourced story. There are a lot of assertions with no obvious sourcing, that's usually what's called "on background" where a source says you can use this, it's true, but you can't attribute it to anybody. Then they switch to quoting to a "senior administration official." They later cite another American official on the strikes, this may or may not be the same person. The New York Times mentions, but the Wall Street Journal highlights another reason behind the strikes. A feared terrorist plot against European targets. They at least have more than one source, they quote "current and former officials." The terror plot, which officials have been tracking for weeks, is believed to target multiple countries, including the U.K., France, and Germany, these officials said. The exact nature of the plot or plots couldn't be learned immediately, and counterterrorism officials in the U.S., Pakistan and Europe are continuing to investigate. There have, however, been multiple terror warnings in recent days in France, Germany and the U.K.
"There are some pretty notable threat streams," said one U.S. military official, who added that the significance of these threats is still being discussed among counterterrorism officials but that threats of this height are unusual. On Morning Edition, Ari Shapiro talks with Peter Bergen of the New America Foundation about the nature of the drone program, and its effectiveness.